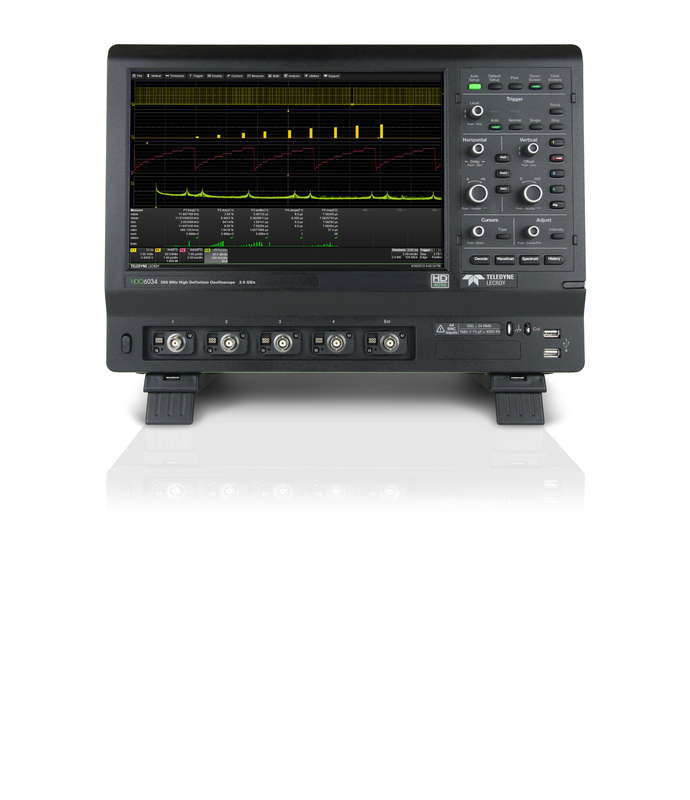 In many applications, the accuracy of a true 12-bit oscilloscope is not only desirable, but necessary. Going forward, this will become the case more and more often. When choosing one, it's a good idea to peek under the covers and gain a little insight into how the instrument operates. Having discussed in an earlier post the advantages of oscilloscopes with 12-bit vertical resolution, let's look at the ways in which that resolution is accomplished in hardware. One way to achieve 12-bit resolution entails a new approach that requires rethinking of the critical signal paths within the instrument. Another is an extension of an older approach involving post-acquisition signal processing. The newer path to 12-bit resolution is to build the platform from the ground up as a 12-bit system. Teledyne LeCroy in our HDO4000 and HDO6000 scopes: Both series have 12-bit ADCs in their front ends, which results in 4096 true discrete quantization levels as opposed to 256 levels in a scope with 8-bit ADCs. In the older approach, 8-bit ADCs are still employed, but adjacent waveform acquisition samples are grouped into bunches of up to 16 samples. Each group of vertical samples undergoes mathematical filtering for a net reduction in random scope noise. It'll provide some improvement in the appearance of on-screen trace displays, but it cannot compare to the results achieved with true 12-bit hardware. One might be tempted to think that achieving 12-bit resolution is simply a matter of swapping out an 8-bit ADC and replacing it with a 12-bit ADC. If only it were that simple! At the output of any ADC, you will find some amount of Gaussian noise which must be dealt with downstream in the gain amplifiers. With 8-bit ADCs, we're talking about signal-to-noise (SNR) ratios of around -45 dB. When using 12-bit ADCs, SNRs are on the order of -60 to -65 dB. The lower Gaussian noise from the 12-bit ADCs opened a window of opportunity for improvement in the front-end amplification chain that would result in tangible gains in overall SNR for a scope channel. Teledyne LeCroy designed a variable-gain amplifier that delivers SNR of -55 dB or better, depending on bandwidth. It's a noise level that's at least four times better than a good 8-bit channel. Another advantage of the Teledyne LeCroy approach is greater dc gain accuracy, which is achieved through careful design of the dc amplification chain. It's no easy task to design an amplifier with low drift and high accuracy while maintaining a high offset range, but this is what has been accomplished in the HDOs. It's very difficult, nigh impossible, for an 8-bit acquisition system to achieve dc gain accuracy of better than +/-2%. In the HDO series, dc gain accuracy is specified at +/-0.5%. As mentioned earlier, post-acquisition processing is another way to improve vertical resolution. However, the application of such techniques in an oscilloscope that still is based on 8-bit ADCs is really the tried-and-true High-Resolution mode with a different name. Without 12-bit ADCs, High-Resolution modes still do not approach the accuracy achieved with a native 12-bit architecture. The biggest downside of processing adjacent waveform acquisition samples is a tradeoff of bandwidth against the gain in vertical resolution. Not only that, but the tradeoff is also dependent on the sample rate of the acquired waveform. The sample rate in turn may depend on other factors, including how much acquisition memory is available and the timebase setting. For example, say you're using a 4-GHz, 8-bit scope at a sampling rate of 5 GS/s. If you ask the High-Resolution mode to give you 1 additional bit of vertical resolution, the -3dB bandwidth point is 1.205 GHz. Crank it up to 2 bits and the -3dB bandwidth drops to 290 MHz. For 3 bits of added resolution, you will have only 80 MHz of bandwidth. It's clear that 12-bit technology makes for a better oscilloscope than does 8-bit technology, but it's also clear that not all 12-bit technologies are equal. Consider these factors when you're ready to upgrade to a 12-bit instrument.